Drawing a stick figure is quick and easy. But can stick figures be used to create art? I’m not going to debate that notion here, but I have stumbled across a pretty sweet website that makes creative use of the stick figure and encourages us all to be a bit more creative. The website is called drawastickman.com. 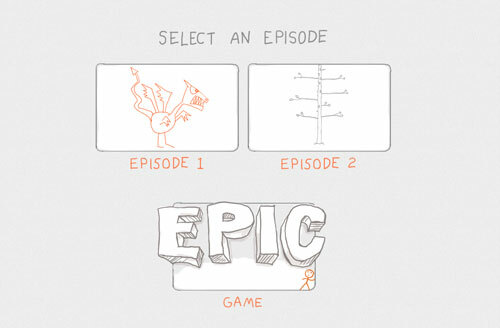 At this site, the user creates a stick figure and then embarks on an interactive story in which the stick figure interacts with a box, a ballon, and fire among other exciting things. At each turning point in the “story”, the user is required to draw a tool, or item that the stick figure needs to complete the next scene. What’s so amazing is the site’s ability to animate what the user draws. The stick figure even walks around the screen, although a bit crudely. The objects that are drawn interact with the other objects on the screen without noticeable glitches . The site is brilliantly put together. It allows the user to have different experiences each time they visit the site if they wish. The story stays the same, but the user can draw anything that they want to entertain themselves. It’s truly a great creative endeavor that’s been created with some pretty fancy coding. When you’re finished with your animated stick figure adventure, you have the option of sharing your experience with others on the popular social networks. The website is the creation of hitcents.com. Hitcents has produced several different creative products including several apps. The company’s creative endeavors have been recognized by many big players in the industry including Adobe and The Webby Awards. It’s good to see people creating fun, interactive art. Yes, I said “art”.